Presents the evolution of Dominican music, from Taino settlements, through colonial times, to modern rural and urban musical genres. The internationally acclaimed singer and music historian will use her unique and extraordinary talents to talk about the history of Dominican music, explain musical trends, schools and rythms and perform some of her incredible melodies. Experience the history and the richness of Dominican rhythms and melodies. Entrance upon arrival (your name MUST appear on list). We're sorry to announce that IRKA MATEO registration is now closed. Thank you for your interest and Stay Tuned. For years now, Irka Mateo´s extraordinary career has been one of breaking boundaries and embracing and awakening people's deepest humanity, in particular, through music. Irka says her artistic sensibility came alive during the years she lived in Spain and France in the late 1970s and early 1980s where she became involved in the emerging world music scene that would ultimately influence her work, her worldview and her passion for the preservation of folk music. Her music continued to incubate in Brazil, Canada, the US and her native Dominican Republic, to which she returned in 1998. It was during this period in the Dominican Republic, after her successful Spanish language recording of Sucre Amer, a song in defense of Haitian sugar cane workers, that she began to perform widely in the Caribbean and, more importantly, immersed herself in the folk music of the Caribbean islands, which is essentially founded on popular religious ceremonies and Taino Culture. 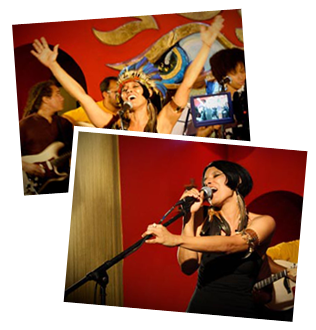 The result of this cultural and musical fusion is music infused with African and Taino traditions. Irka's research led to the founding of the Guabancex, Wind and Water Society dedicated to the popularization and preservation of native culture. As part of her continued research on Taino Culture, Irka has been collaborating, since 2008, with the Smithsonian Institution and the National Museum of the American Indian in New York City where she gives concerts and workshops on Taino instruments, music and dances. She has taken her "Taino Mythology through Music" workshops to various universities and cultural institutions in the Dominican Republic and the United States.